from New Food of Life, pp. 170-171. In the early 80s, I shared a house in San Francisco with friends, two of whom were Iranian. One of those Iranians, a gentle man name Hamid, cooked traditional Persian dishes most of the time. I count my time in that house as one of the most formative culinary experiences of my life. 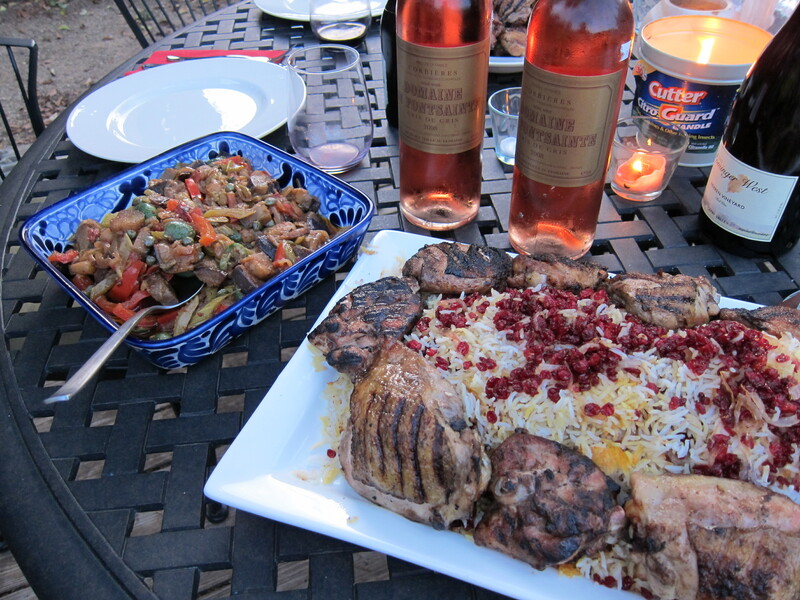 Persian cooking remains very high on my list of favorite cuisines. From the crunchy rice called tah-dig to gormen sabzi to this dish, I love the fragrant complexity of Persian spicing — cinnamon, cardomon, ginger, cloves, cumin, dried roseflower, mint, and saffron. Imagine my joy when I discovered Mediterranean Market here in Sacramento. Never have I lived in close proximity to this halal store that has yet to let me down when I need an ingredient for the Persian, Greek, and Middle Eastern food I cook. Now I buy tins of Ceylon, Darjeeling, and Early Grey tea there as good as any I can find in London and far cheaper than I pay for tea at Peet’s. This is the only place in town, as far as I know, that sells barberries. They keep them in the refrigerated section. To feed my friends, I decide to make my favorite Persian dish, Zereshk pollo. The tart red barberries look like rubies cast among the golden saffron rice. Delicious. I also made a Yotam Ottolenghi caponata, which was delicious. You’ll find it here. I made a significant change in the Barberry rice and chicken recipe. Instead of roasting a whole chicken, I used the Gourmet Cookbook’s excellent Flawless Grill Chicken — essentially, you brine, grill, and then toss chicken thighs with a vinaigrette made with the spice in the rice. I think it worked pretty well. Makes 6 servings; preparation time: 40 minutes; cooking time: 2 hours, 5 mins. Shadowcook: Or an equal amount of chicken thighs. Make a brine of 8 quarts water, 1/4 cup sugar, and 1/2 cup kosher salt early in the morning; let it cool. Six hours before grilling, brine the chicken pieces. Pat dry before grilling. Shadowcook: Or just one, if you’re grilling already cut up pieces. Shadowcook: Oh, the only way to go is ghee! Shadowcook: I felt sheepish asking for advieh at Mediterranean Market. It turns out that advieh means “spice mix,” so asking for it won’t get you very far. Look for packaged rice seasoning and then look at the ingredients. You want to see a combination of cinnamon, cumin, cardamon, ginger, cloves, and dried rose bud flowers. 1. Clean and wash 3 cups of rice 5 times in warm water. 2. Place the whole chicken in a baking dish. Stuff the bird with one of the whole onions, the garlic, and sprinkle with salt, pepper, and 1 teaspoon saffron water. Cover and bake in a 350 oven for 1 1/2 – 2 hours. 3. Clean the barberries by removing their stems and placing the berries in a colander. Place colander in a large container full of cold water and allow barberries to soak for 20 minutes. The sand will settle to the bottom. Take the colander out of the container and run cold water over the barberries; drain and set aside. Shadowcook: Don’t skip this part. Sand does indeed settle to the bottom of the bowl. 4. Sauté 1 sliced onion in 2 tablespoons butter, add barberries and sauté for just 1 minute over low heat because barberries burn very easily. Add 4 tablespoons sugar, mix well, and set aside. Shadowcook: The above is what I called Under-instruction. Give yourself time to sauté the onion. You are caramelizing the thinly sliced onion, but so to the point of greatly diminishing the amount of onion. The sweeter and more caramelized you get the onion, the best the contrast with the tart barberries. 5. Bring 8 cups water and 2 tablespoons salt to a boil in a large, non-stick pot. Pour the washed and drained rice into the pot. Boil briskly for 6 to 10 minutes, gently stirring twice to loosen any grains that may have stuck to the bottom. Bite a few grains; if the rice feels soft, it is ready to be drained. Drain rice in a large, fine-mesh colander and rinse in 2 or 3 cups lukewarm water. 6. In the same pot heat 4 tablespoons butter and 2 tablespoons water. 7. In a bowl, mix 2 spatulas of rice, the yogurt, and a few drops of saffron water and spread the mixture over the bottom of the pot to form a tender crust (tah-dig). 8. Place 2 spatulas full of rice in the pot, then sprinkle 1/2 teaspoon Persian spice-mix or cumin over the rice. Repeat these steps, arranging the rice in the shape of a pyramid. This shape allows for the rice to expand and enlarge. Cover and cook 10 minutes over medium heat. 9. Mix the remaining melted butter and saffron water with 1/4 cup of water and pour over the pyramid. Place a clean dish towel or paper towel over the pot; cover firmly with the lid to prevent steam from escaping. Cook for 50 minutes longer over low heat. Shadowcook: You know have 50 minutes to pat dry the chicken pieces and prepare your grill. If you’re using charcoal, as I did, you should already have started a chimney of briquettes. Let the fire die down to medium-hot before putting the pieces on the grill. 10. Remove the pot from heat and allow to cool, covered, for 5 minutes on a damp surface to free crust from the bottom of the pot. 11. Remove lid and take out 2 tablespoons of saffron-flavored rice and set aside for use as a garnish. 12. Then, gently taking 1 spatula full of rice at a time, place rice on a serving platter in alternating layers with the barberry mixture. Mound the rice in the shape of a cone. Arrange the chicken around the platter. Finally, decorate the top of the mound with the saffron-flavored rice, some of the barberry mixture, and almonds and pistachios. Note: You may place the barberries in the rice and steam them together but the color of the barberies will not be as red as when you layer them with the rice at the last minute. Shadowcook: Absolutely right. Visually, the red barberries are very pretty.